Mathura is a place of pilgrimage and it is visited by thousands of men and women from different parts of India every year. There are meny temples here, but the most famous is that of Shri Dwarkadhish. This temple is situated in the heart of the city near Vishramghat. I had an occasion to visit Mathura in the month of Shravan. A number of persons visit the birth place of Lord Krishna at this time. I went to the river Yamuna early in the morning at 6 a.m. and after taking my bath in the sacred river, and offering my prayers. 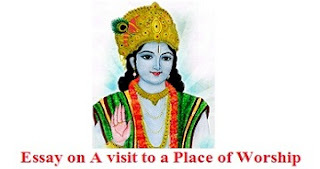 I went to the famous temple of Shri Dwarkadish. Inside the main gate of the temple a flight of stairs upwards leads the visitors to the countryard of the temple. We had to put off our shoes, and keep them outside with a guard who charged us 5 rupees per pair. We were not allowed to take our socks, umbrellas or any other thing made of leather inside the temple. There is a big platform before the main room where the idol of Lord Krishna is placed. A certain time is fixed when the temple is open to visitors. There was a great rush of people as the main room was not yet open. Suddenly the main room opened and we had the darshan of the great deity. Many people prostrated themselves before the Lord. The devotees placed their offerings before the Lord and the priest gave them ‘Charnamrit’ and ‘Prasad’. There are beautiful paintings on the walls depicting various scenes from the life of Lord Krishna. We came out by the other gate leading into a small lane. Again in the evening, I went to the Yamuna river and witnessed the ‘Arti’ of the sacred river. Then I went to the temple. There was a very heavy rush and there was enough police arrangement to control the traffic. With great difficulty I entered the temple. The whole temple was flooded with electric light. There were costly ‘Chandeliers’ all-round. There were two ‘Hindolas’ one of pure gold and the other of silver. The walls were covered with black cloth, this is called ‘Kali ghata.’ The temple was beautifully decorated. After having a darshan we came out.